Please see below for flight information, aircraft details, images and pricing with safety ratings. Phenom 300 Expect more out of every flight. Get out and explore with the Phenom 300 ® thanks to more room, more range and the best performance in the category. 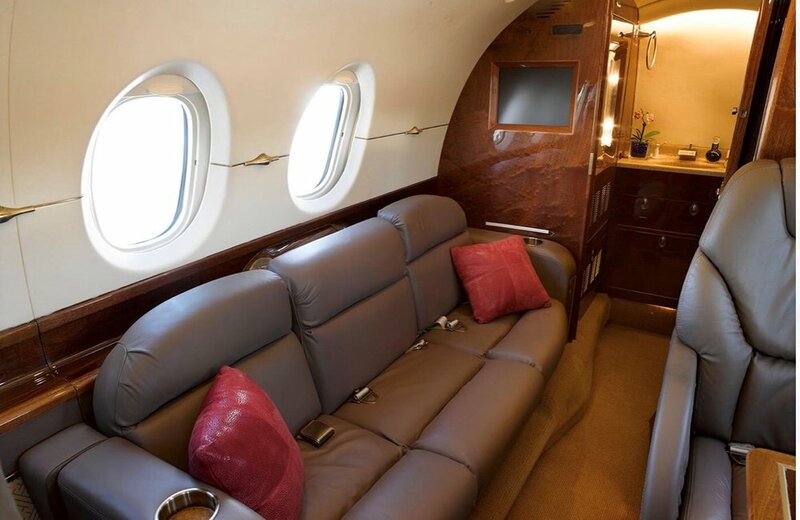 With seven spacious club seats, you can fly nonstop from Dallas to New York City among a beautifully appointed interior wrapped in fine leathers and woods. Gulfstream G100 The Gulfstream 100 was designed fly long distances at high speeds. It can easily complete nonstop trips from Seattle to New York or from Singapore to Tokyo and has a maximum cruise speed of .84 Mach. Safety Rating: Gold Rating - Argus Gold rating and has average or better historical safety rating. Meets or exceeds ARGUS equipment and pilot standards. Beechcraft Hawker 800XP is one of the most successful private jets that British Aerospace has ever made. It is a third-generation model of the 800 series, and is similar in part to the ubiquitous Hawker 400XP. The cabin measures 21.3 feet long by 6.0 feet wide by 5.8 feet tall giving it a total cabin volume of 736.0 cubic feet making it comfortable for up to 8 passengers. Safety Rating: Platinum Rating - The highest level of ARG/US safety ratings is awarded to those operators who meet the criteria for Gold, and successfully pass an ARG/US on-site safety audit. The ARG/US audit is a true process audit administered by trained and experienced aviation auditing professionals to evaluate the operator against industry best practice standards. A Platinum rating requires a functioning Safety Management System, and clear and workable Emergency Response Plan, and appropriate written standards, implementation, and records for all major aspects of Operations and Maintenance within a flight department or Charter company.